72W X 36H (3 panel system; each panel 24w x 36h). Fast and easy system makes set-up a snap. Remove the lightweight, trifold panels from the carrying bag, unfold and place on floor or tabletop. 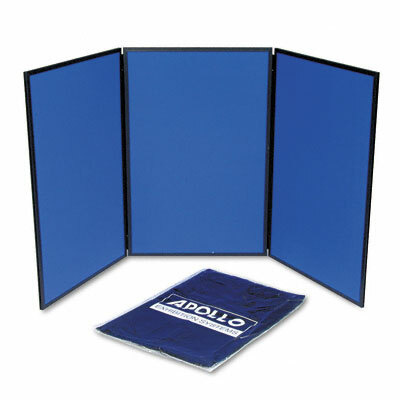 Fabric panels accept Velcro® fasteners or push pins. Duralite construction with black PVC frame for easy portability. Header Panel sold separately. 72W X 36H (3 panel system; each panel 24w x 36h). Blue reverses to gray.